Tuscany is one of the most famous Italian Regions. It’s found in central Italy (North of Rome). Italian wines have several good health properties. While studies have long showed that red wine is helpful for the heart, we’re only recently discovering the huge benefits wine gives when applied topically. Resveratrol, a potent antioxidant found in high concentrations in grape seeds, stems and skins is easily absorbed by the skin, working its magic to reduce inflammation and slow the oxidation that often causes the skin to age prematurely. Grapes are also ripe with polyphenols, another potent antioxidant which fortifies the skin. Tuscany is famous worldwide for its excellent production of wine thanks to its unique D.O.C., I.G.T. and D.O.C.G. wines. If one is looking for a dry red wine from the Italian region, Chianti may just be the perfect choice. This medium-bodied wine is made from the Sangiovese grapes and comes largely from the Tuscany area. 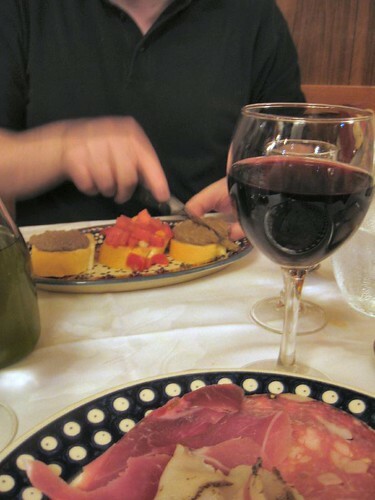 Chianti goes with red meats, pasta and shellfish as well as certain types of poultry dishes. Wines made from the Sangiovese grape are the ideal wines for comfort food. Pasta drenched in marinara or tomato based sauces is a no-brainer with them. Roast beef, steak, steak prepared in a red wine sauce, beef stew, short ribs, hamburgers and beef stroganoff. Grilled or roasted chicken with fresh herbs. Cornish game hens, duck with rich or hearty sauces, turkey with rich or heavy sauces. Pasta with meat, ragout or Bolognese sauces, lasagna. Pizza with tomato sauce, pepperoni, sausage, mushrooms, olives and mozzarella. Roasted or stuffed red bell peppers, hearty bean-based dishes. Parmiggiano, Romano and other hard cheeses, Cheddar and other savory, firm cheeses. The Best way to visit Tuscany by bicycle is touring the Chianti Region. I’s a good opportunity to combine healthy foods with physical activity.